How much lower? 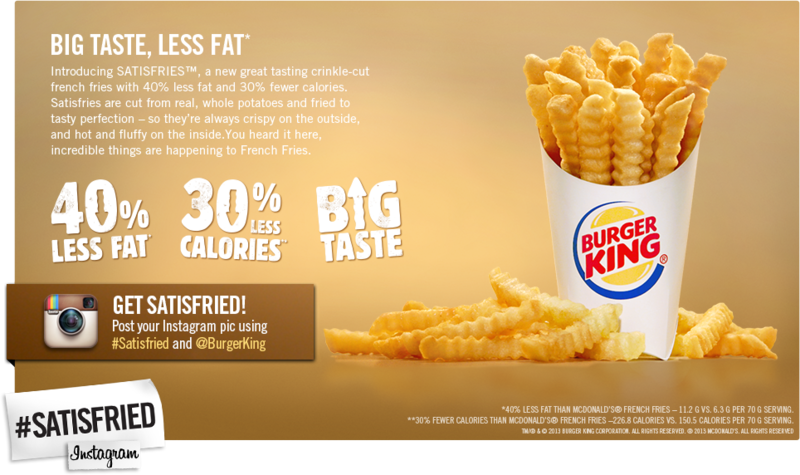 A small order of Satisfries has 11 grams of fat and 1.5 grams of saturated fat compared with 17 grams and 2.5 grams of saturated in a small order of BK’s regular fries. Looking at a large order, which in the old days would have been what I purchased, a large Satisfries has 17 grams of fat and 2,5 grams of saturated fat compared with 22 grams and 3.5 grams of saturated in a large regular fry. Seventeen grams is about half my now daily limit of 40 grams of fat, so I’ll likely still avoid the new fries as I do most fast food these days, with the exception of some salads. I tend to avoid all salad dressings because of sodium as well, some salads can have more sodium than fries, as I wrote yesterday. I applaud Burger King for this effort. It’s long been known as the chain that caters to the outrageous tastes of teenage boys, so to see it do something to cut fat in a product is laudable.